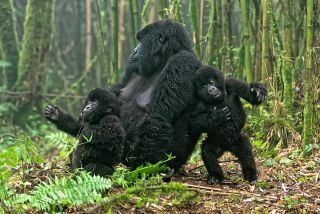 Images from ten photographers have been selected as the winning shots in this year's Remembering Great Apes competition. The contest saw images from photographers Andy Edge, Christopher Whittier, Jacha Potgieter, Julie Duncan, Latika Nath, Pim Volkers, Richard Denyer, Sam Clark, Shannon Witz, and Vladimír Cech selected from over 1000 submissions. Their winning photographs depicted gorillas, orangutans, chimpanzees and bonobos in their natural environments, captured across Borneo and a variety of sub-Sarahan African countries. The ten winning images will be displayed at a gala evening event on 18 October at London’s Royal Geographical Society (RGS), and are also set to be included in a coffee table book, Remembering Great Apes, in aid of Born Free. Publication of the book has been made possible following a successful Kickstarter campaign, which ended up attracting over £126,000 of pledges. The previous two books in the Remembering Wildlife series have already helped to raise £315,000 towards conservation. It's hoped that this third title, whose foreword includes a contribution from Jane Goodall DBE, will help to push this figure through the £500,000 barrier. “The standard of entries this year was incredibly high,” commented Margot Raggett, Remembering Wildlife founder. “And we are thrilled that the winners will be a beautiful addition to our book.” Other judges included zoologist Mark Carwardine and Digital Camera magazine editor Ben Brain. Winning images will be displayed at the gala evening event alongside works from the likes of Brent Stirton, Art Wolfe and Frans Lanting. This will be followed by a two-week exhibition at La Galleria, Pall Mall. Tickets to the event can be purchased here, and you can pre-order the book from the Remembering Wildlife website.